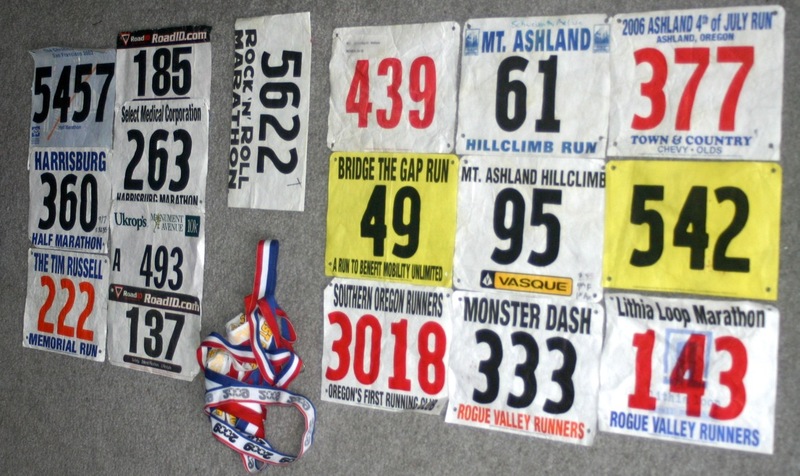 Having done a number of running races, I’ve accumulated a pile of race bibs, as well as medals on various kinds of ribbon. I’m not one to stockpile things I’m not using and wondered what they might be good for after a while. After repurposing some food and beverage wrappers into bags and other items, I thought these would make a cool tote bag as well. 1. 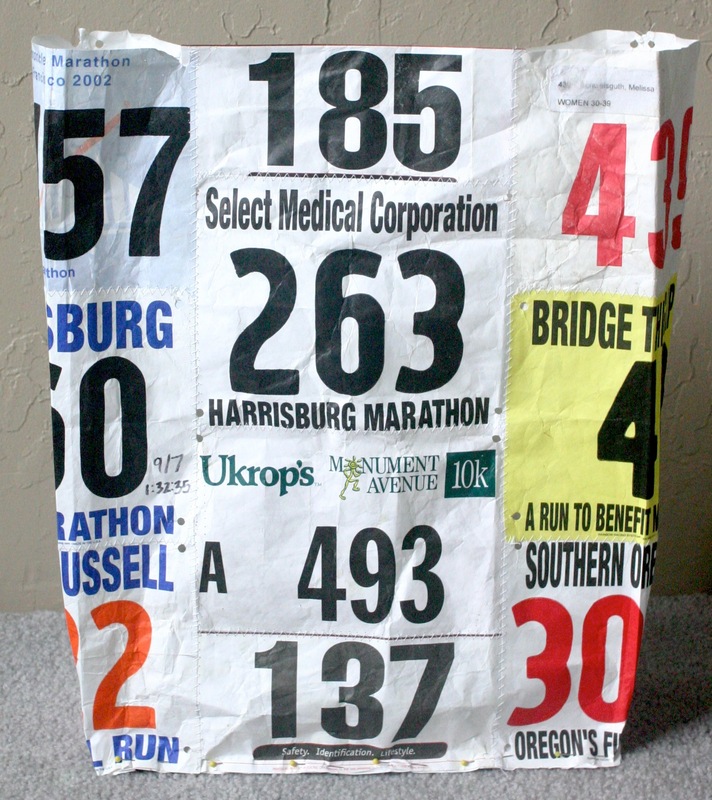 Gather race bibs and ribbon from race medals, and an old tyvek envelope if you have one. 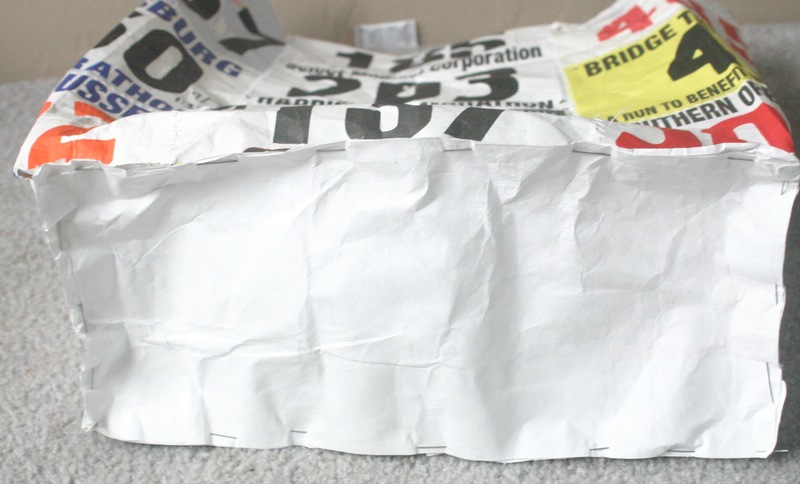 Lay out race bibs in order to be sewn. 2. Sew together using a top-stitch zig zag (less likely to tear/perforate material than straight stitch on backsides in traditional sewing). I sewed mine into a continuous loop versus piecing together 4 sides, since I didn’t have the right number of rows to make 2 sets of even sides and maintain the zig zag stitch…and it’s easier and quicker. 4. Cut tyvek envelope, other scrap tyvek or more bibs to shape needed for bottom, allowing a little extra room for seam allowance and any adjustments needed. 5. Pin bottom on and baste using a long top stitch length. 6. Cut ribbons and sew together to make length needed to cover bottom seam you’ve basted. Pin on, folding over top and bottom evenly, and sew with a top-stitch zig zag. 7. Cut and sew ribbons for handles. Attach where you have zig zag stitches and sew over the zig zag for a cleaner look, and less additional holes in the material. 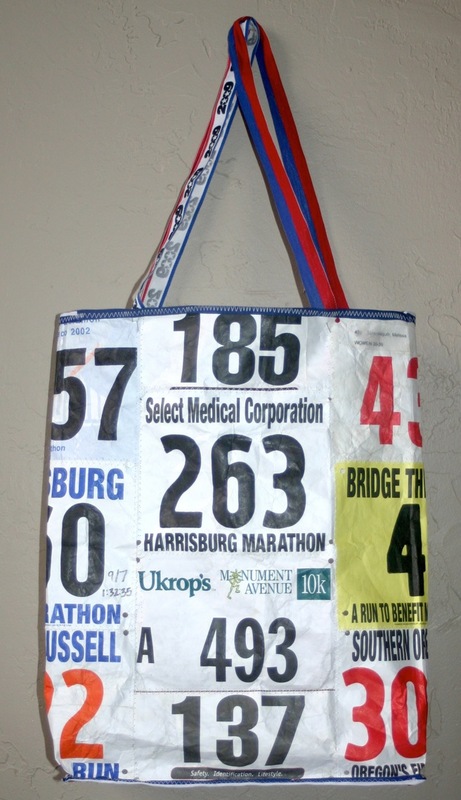 This entry was posted in Creative Reuse & Repurposing and tagged running. Bookmark the permalink. Thank you for sharing. I have been wanting to make one of these for a long time. Now I’m going to give it a shot. Cute idea, thanks! I have them all stacked up in a drawer just WAITING for something to do with them! Rhonda & Emily – Congrats on all your races – now you can share them with pride! 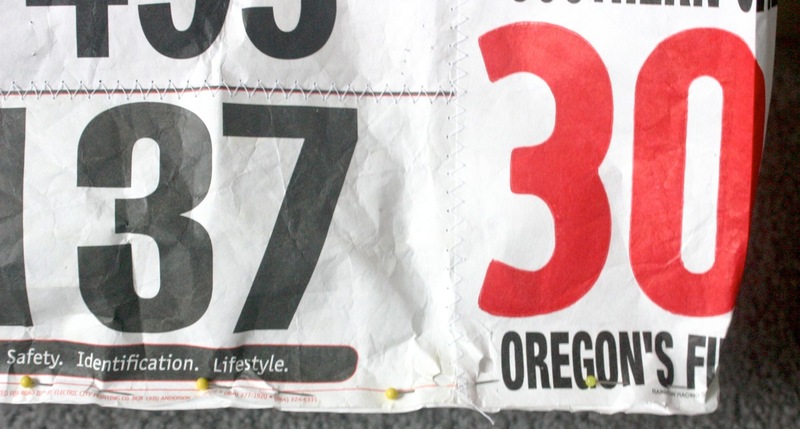 Way to go – happy running & repurposing! Race t-shirts make great bags, too and you need only one to make a bag. Love it, perfect post-run tote to carry wipes, hand towel and change of clothes. LOVE this idea, made my own and went to the Run Expo for the Around the Bay Road Race and even John Stanton commented on how cool it was. Needless to say I gave props to you and posted the link to the blog/instructions again so we could spread the cool idea around! Thanks for the comment and glad you made your own. 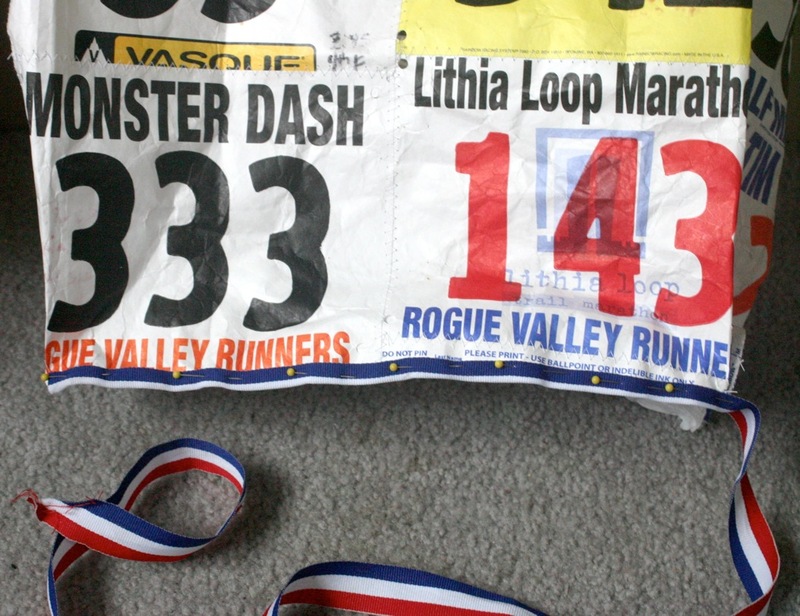 Congrats for running enough races to make one – an accomplishment in itself! I love it!!!! great idea 🙂 super creative. Ummmm did I just see you at the ATB expo with John Stanton??? ?